It may seem counterproductive to pour hot espresso over a scoop of vanilla ice cream, but don’t doubt the results — it’s unbelievably delicious. I served this flavorsome beverage with dessert after Christmas dinner. Using the recipe from Winter Cocktails, my brother-in-law Brian and I prepared this affogato speciale for festive consumption. An adult twist on the Italian dessert affogato, the word literally translates to drowned. First, I dusted off my stove top Moka Pot and Brian brewed a fresh batch of espresso. We used fine quality French vanilla ice cream, and the DiSoronno Amaretto is never far from my reach. When it came to the Chocolate Stout, I did my homework; Samual Smith’s Organic Chocolate Stout is one of the top rated stouts in its category. Lucky for me it’s available locally. This drink deserves to be served in your favorite cocktail glass. Place the ice cream scoop in the bottom of the glass. 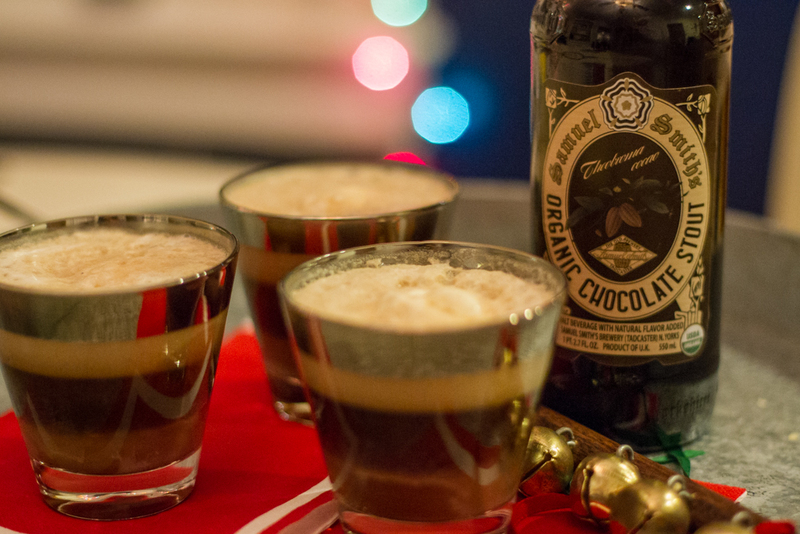 Pour amaretto, espresso, and stout over the top. Serve with a spoon. Your taste buds will thank you! A special thank you to my sister Michelle for taking the tantalizing photos. Next Post Amazed and Infused.